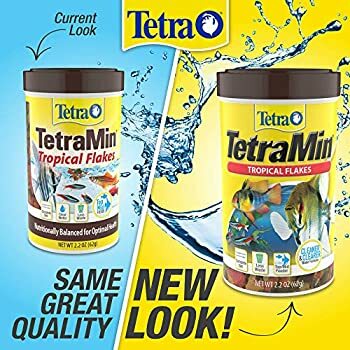 If you’re looking for something to feed your tropical fish that’s healthy and enriched with all of the essential nutrients to keep your fish in the best possible condition, then you should consider switching your fish over to Tetramin’s Nutritionally Balanced Tropical Flake Food for Tropical Fish. Tropical fish are an absolute pleasure to look at, and most people – even if they don’t keep a population of fish themselves – can spend hours staring in amazement at the sheer majestic beauty of a tropical tank. But as beautiful as a tropical tank can be to keep, it can be just as hard, especially for people who are still new to the nuances of keeping a tropical fish tank. It’s a very fine art to keep a tropical tank healthy and in good condition, and you have to give your fish the absolute best conditions that you are able to if you want them to be healthy. This means giving them access to the best, clearest water that you possibly can, and giving them access to a proper, well kitted-out tank – and it also means giving your fish access to the best possible food that you can afford. You’ll see the benefits in your fish population within a few days to weeks of switching them over. There are plenty of benefits behind TetraMin’s product, including the fact that it’s been formulated with your tank’s health in mind – and it’s enriched with all of the nutrients and probiotics your fish might need. It’s also easy-to-digest (yes, even for tropical fish with special needs) which means that your fish will be healthier – and your tank will be much cleaner. There are also added antioxidants and proteins that enrich the formula further, ensuring for perfect health for your tank, less of a mess in the tank itself and very healthy, happy fish.